Step 1 | After you gather your supplies measure your rolled up elastic bandage. You need to lay the elastic bandage on its side on a table and measure the length and then the circumference. Write these numbers down so you do not forget them. 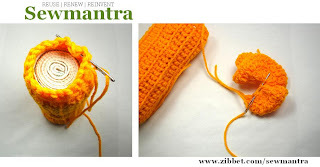 Step 2 | Using your crochet hook and yarn make your base chain. 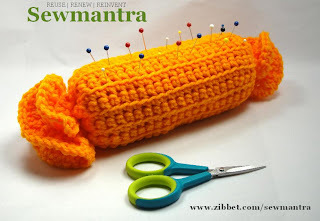 Using the chain stitch make it the same length as the circumference of your elastic bandage. 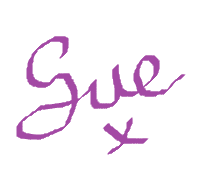 (Remember you wrote that down before, told you, you would need it). 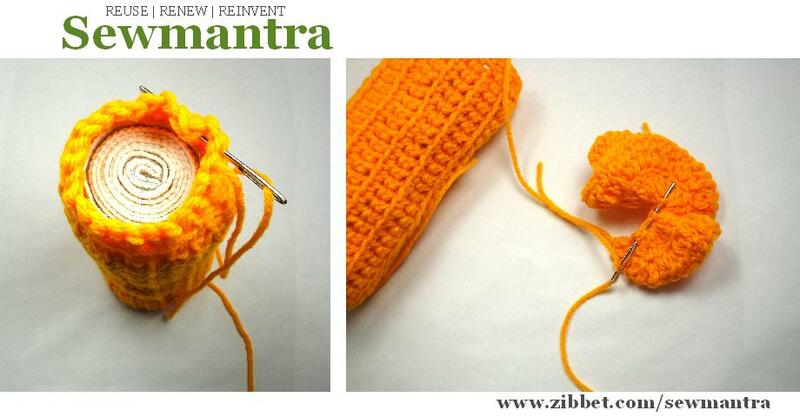 Then using either a slip stitch or a single crochet stitch, start creating your rows. – you’ll need to form a square shape to wrap around your elastic bandage….eventually. Step 3 | Next, as you start to see your crocheted item shaping into a square, hold it against the elastic bandage and see if it overlaps just a little (say .75 inches or 1.905 cm on each end) – it does not need to be perfect, but some overhang is necessary for the end pieces. 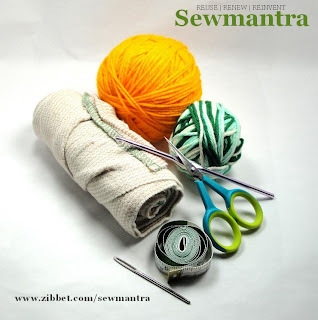 Once you have your overhand, fasten off at the end of the row and weave in any loose ends and trim where necessary. At this time you should have a square looking piece. 1. At the end of your chain of 10 slip stitches, then add 3 double crochet to each top loop of your base chain. This creates a wide, flat row, and it will spiral a bit. 3. When you reach the end of the second row, fasten off your stitch. Step 5 | Now you should have all the pieces you need to assemble your candy pincushion. Next, tread your darning needle with a long piece of yarn. 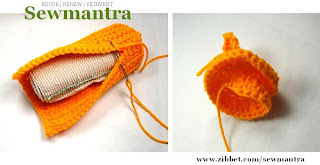 Place your crocheted square around your elastic bandage and secure the seam edges with a whip stitch. Leave a long tail piece at the start of your whip stitch, you’ll need that in a minute. Note: Your ends should still be open at this time! Step 6 | You’ve reached the end of your seam, now you should still have some yarn left. Do not take your needle off. Next weave your needle through the loops until you come full circle. Do not synch down yet, one more step. Step 7 | Doing the same weaving in and out, go through the bottom loops of the ends you made or the “candy ties” as I call them. Once you have woven through to the end, synch down everything so it is tight. Then tack your loose corner with the remaining yarn you have and then tie off. Finally trim any extra yarn that is peeking out. Note: To attach the other side, simply cut a shorter piece of yarn and follow steps 6 and 7 for the other ‘candy tie’. Step 8 | Put your sewing pins in your new Candy Pincushion and Enjoy! This pattern and post was brought to you by Martiel Beatty the designer and artists at Sewmantra. Please spend some time and visit her sites. They are well worth the visit and following! That is one sweet pattern! Thank you for sharing it! I especially love the fact that the centre (stuffing) is fabric. I can use up the old washcloths/dishcloths that have holes in them or are too faded to be seen as the stuffing! Awesome idea!!! Thank you ever so much for your comments, I have forwarded them to Martiel.